Proto-Vest manufactures innovative, high quality automotive drying equipment that has low energy requirements. The dryers can improve the efficiency and profitability of any car wash from an in-bay automatic to a high volume tunnel application. Along with an extensive line of dryers, a variety of options are available for any Proto-Vest dryer including products for noise reduction and energy savings. What’s New/Best Sellers • Proto-Vest Ultimate Tunnel Heater. Advantages/Features • The Proto-Vest Tunnel Heater utilizes the tremendous air distribution already being generated from the drying system to effectively heat the car wash tunnel during cold winter months. 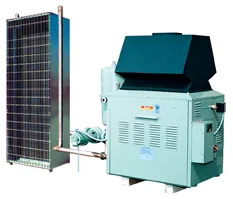 The heater helps to prevent frozen pipes, ice build-up, and even eliminate down time. Air is delivered at about 155°F directly to the vehicle’s surface, offering higher drying efficiency while heating the tunnel to approximately 70°F. The unit comes equipped with a control system that adjusts settings automatically to accommodate the outdoor air temperature. The heater is an option for any steel blower housing Proto-Vest system. Customer/Operator Support • Proto-Vest offers extensive after sales support and access to a wide range of services including custom engineering. Founded in 1969, Belanger Inc. is a full-line car wash manufacturer. 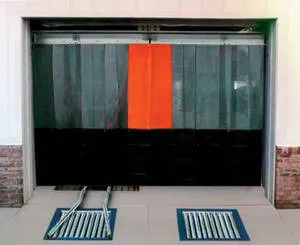 Its equipment maximizes wash bay Profit-Per-Foot through a smartly optimized combination of high-performance wash results, low maintenance costs, system longevity, and unparalleled customer appeal. What’s New/Best Seller • Belanger’s Wind Door. Advantages/Features • Belanger’s Wind Door features heavy-gauge vinyl flaps that form a weather-tight seal to protect a bay against the elements. During cold weather, this helps keep warm air in, preventing equipment freeze-ups and costly potential downtime. The door’s aircraft-grade aluminum frame, zero-maintenance UHMW rollers, and leaded cloth hem ensure reliable year-round operation. To provide the most installation options, a limit switch, photo eyes, or controller tie-in may activate the door. Service/Installation • Business planning and complete system training are offered. Extensive local distributor network and a technical support and aftermarket parts team are available. 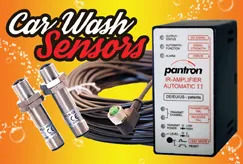 Pantron Automation Inc. offers high quality photoelectric sensors for applications in the vehicle wash industry. Products include infrared photoelectric sensors, infrared amplifiers, multi-channel amplifiers, and inductive proximity switches. What’s New/Best Seller • Automatic Amplifier with Built-In Test and Diagnostic Features Paired with Quick-Disconnect Sensor Eyes. Advantages/Features • Pantron’s photoelectric sensors with quick connectors provide a fast installation and maintenance solution. The sensors are rated IP67 and are designed to penetrate steam, fog, ice, soap, and dirt. Pantron’s automatic amplifier has built-in diagnostic features to assist with alignment of the photo eyes and to pinpoint problems with the sensors. Customer/Operator Support • Free technical support and application assistance are available. Extrutech Plastics is an ISO 9001 QMS certified, USA manufacturer, now in its 25th year of providing bright white, easy-to-clean, wall and ceiling panels to the car wash industry. What’s New/Best Seller • ExtrutchFormo. 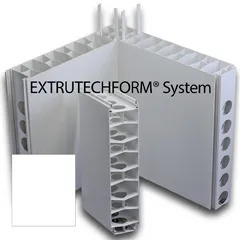 Advantages/Features • ExtrutchFormo is a patented, stay-in-place concrete wall form system for high moisture areas, built to stand up to harsh car wash environments. The panels provide a bright white, smooth, non-porous, pre-finished wall for both interior and exterior walls. Panels will not rot, rust, or flake, are 24” wide, widths of 6”, 8”, or 12”, and lengths to 20’. Panels are pre-cut to project specifications and arrive at your location ready for setup. With strong snap together, E-locking edges, panels can be setup side by side without having to lift one panel over the other to connect them, resulting in a bright white, easy-to-clean finished wall that is made to last for many years. Price • Available on request. Hydro-Spray started in 1978, as an in-bay automatic and self-serve equipment manufacturer in Cedar Falls, IA. Forty years later, the company continues to be innovative by leveraging the latest technology and putting it to the test in an effort to bring advancement and reliability to the car wash Industry. The main focus today is designing and manufacturing products that either solve a problem, create efficiencies, or enhance operations for the best consumer experience. What’s New/Best Seller • SubZero Winterization System. 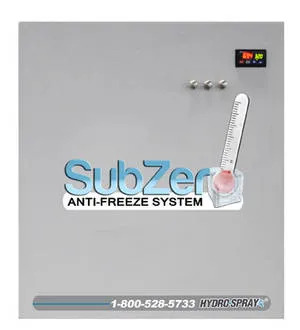 Advantages/Features • Subzero technology controls the flow of compressed air and an anti-freeze solution to purge and protect exposed fluid lines from freezing in the wash bay and other similar applications. The smart controller works off of two main signals. The first signal is the outside ambient temperature, which has two automatic set points to enable the system. The second signal works off of a 24-volt signal from the wash bay to complete the blow down and or antifreeze purge. This process drastically reduces dependency on fresh water weeping and sewage costs. Equipped with fail safe protection should power, air compressors, or a system component fail, the subzero system will detect any failure. Once the system detects a failure it will enable city water weep and then automatically detect when the failure is resolved and continue its normal operation. XpresSystems manufactures the XpresWash loyalty program based on RFID technology. Multiple ways to sell wash packages. Great for all types of washes. Has proven to work well at both standalone washes and in the convenience store environment, regardless of the wash equipment. Customers can use the wash at all of your sites equipped with XpresWash. What’s New/Best Seller •XpresWash Loyalty Program. 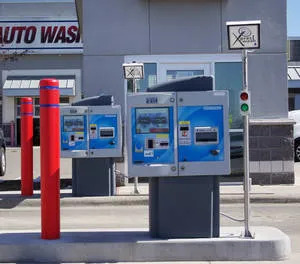 Advantages/features • The XpresWash loyalty program easily integrates with most commonly used car wash equipment and entry systems. There is no need to roll down windows during the cold winter months. Thoroughly tested in all climates including cold Minnesota winters. Easy to use with built-in redundancy. If Internet goes down your customers can still wash their vehicles. Includes built-in credit card auto billing for individuals and fleet use. Service/installation • Can be installed in less than a day. Telephone support available. 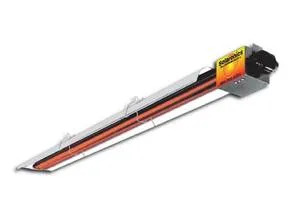 Solaronics has been manufacturing infrared heaters for more than 56 years and offers a full line of infrared heating products for the auto wash industry including the DoorJet heater that has been installed in numerous washes. What’s New/Best Seller • Gas Infrared Heaters. Advantages/ Features • The two-stage feature allows the unit to operate in low fire, which saves on fuel costs, when the tunnel is closed and reserve high fire for the extremely cold days or when the tunnel is open during operating hours. The radiant tube system can be used with stainless steel tubes or heat-treated aluminized. Operator/Customer Support • The rep locator on the company website help operators find the help they need.